Trevor Hemmings’ homebred Cloudy Lane has headed the John Smith’s Grand National antepost market since defying a 20lb rise to outpoint Ungaro by seven lengths in the Coolfun Ltd Grimthorpe Chase at Doncaster on March 1, with totesport.com Becher Chase winner and former market leader Mr Pointment last of the six finishers. Cloudy Lane has enjoyed a career full of promise. He was runner-up on his career debut in a Uttoxeter bumper on April 30, 2005, and went one place better at Southwell the next month. The following campaign saw him open his account over hurdles at the third attempt, scoring over two and a half miles at Haydock in January, 2006. He returned to the course and distance the following month and, racing on heavy ground, saw off this season’s Welsh National winner Miko De Beauchene. 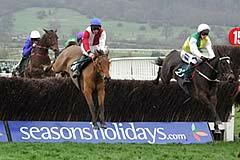 A runner-up finish at Bangor over three miles followed but Cloudy Lane ended the 2005/2006 season with a third triumph at Haydock, seeing off subsequent Pertemps Final hero Oscar Park by six lengths in the Red Square Vodka “Fixed Brush” Novices’ Hurdle Final. Cloudy Lane’s debut over fences came at Aintree in the Digital Prints From Bonusprint.com Novices’ Chase on October 22, 2006, when he was third to Turko. He was then only sixth to Mr Pointment at Bangor that November but hit the scoresheet in a three-mile beginners’ chase at Newcastle on December 16 that year. A return to the course and distance saw a blunder at the last, with the race at his mercy, bringing defeat at odds on, and a foray into handicap company in the Grade Three Red Square Vodka Gold Cup at Haydock was a bridge too far at that stage of his career as he came home a distant 10th. He bounced back in the Fulke Walwyn Kim Muir Challenge Cup to give his trainer a first success at the Cheltenham Festival. His novice season ended when he was hampered and unseated Tony Dobbin in the Irish Grand National. Cloudy Lane has progressed throughout the 2007/2008 season. Defeat on his seasonal bow was followed with victory over Comply Or Die in the Sodhexo Prestige Tommy Whittle Chase at Haydock on December 22. On February 9, he went to Ayr and trounced Another Rum by eight lengths, carrying top-weight of 11st 12lb on heavy going, before completing the hat-trick in fine style at Doncaster. Trevor Hemmings, who was born on June 11, 1935, boasts a classic rags to riches story. Born in London, he was sent to Lancashire as a child during World War II and began life as a bricklayer’s apprentice and rapidly worked his way up the Pontins holiday business to the extent that he was able to sell it on to Scottish & Newcastle in exchange for a significant share holding in S & N (1989). He bought Pontins back in 2000 but retained a stake in S & N, which netted him £218 million when the company was sold in January. He is also a major shareholder in Arena Leisure Plc, which owns Folkestone, Lingfield, Southwell, Wolverhampton and Windsor racecourses and manages Doncaster, Great Leighs and Worcester. Arena is also a major shareholder in broadcaster At The Races that owns some of British racing’s media rights. Hemmings’ many other interests include Blackpool Tower and the Winter Gardens in the North West resort. His empire also includes hotels, a wallpaper business and in June, 2000, another company in which he has a major share, Rodime Plc, paid £161 million for the Littlewoods pools business, which included the bookmaker Bet Direct (since sold). He was said to be worth £980 million in the 2007 Sunday Times Rich List. He also owns a share of Preston North End FC. In recent years he has stepped up his involvement in racing and fulfilled one of his greatest ambitions when Hegehunter carried his colours to victory in the 2005 John Smith’s Grand National. After years of trying, Hemmings finally emulated his mentor Fred Pontin, owner of the 1971 National hero Specify, with his 13th Grand National runner Hedgehunter. His first winner came on the Flat in 1985 but Hemmings now brings on young jumping stock at Gleadhill House Stud, managed by former trainer Mick Meagher, at his base at Chorley in Lancashire, and at his Monymusk Stud in Co Cork. He first tried to win the John Smith’s Grand National with the Stan Mellor-trained Rubika, who finished 14th in 1992. His 80-plus horses are split between Sue Smith, Nicky Henderson, Henrietta Knight, Nicky Richards, Henry Daly, Willie Mullins, Jonjo O’Neill, Peter Beaumont, Ferdy Murphy, Chris Grant, Donald McCain Jnr, Oliver Sherwood, Paul Nicholls, Alan King, Nigel Twiston-Davies and Malcolm Jefferson while he has predominantly younger stock with Eugene O’Sullivan in Ireland. Hemmings, who was made an honorary Jockey Club member in December, 2006, resides in the Channel Islands and is said to have paid £12 million for the Ballavodan estate on the Isle Of Man. Hemmings had a double at this year’s Cheltenham Festival with Albertas Run in the Royal & SunAlliance Chase and Old Benny in the Fulke Walwyn Kim Muir Chase. Born on March 13, 1970, Donald McCain Jnr is the son of Ginger McCain, trainer of the legendary Red Rum, the only horse to win the John Smith’s Grand National three times (1973, 1974 and 1977) and also Amberleigh House, the 2004 victor. Donald learnt to ride on his sister Joanne’s pony Gambol and rode in his first race on the Flat aged 15 (his father told a few white lies so he could ride) at Haydock Park. He subsequently became a jump jockey, firstly as an amateur and then a professional, riding around 40 winners under Rules. He rode several times over the Grand National fences, finishing fifth aboard Harley in the 1992 Fox Hunters’ Chase and 17th on Sure Metal in the 1996 Grand National. He also spent time working in the stables of Luca Cumani, Sir Michael Stoute and Oliver Sherwood. Donald subsequently became assistant trainer to his father at Bankhouse Stables at Cholmondeley in Cheshire and played a significant role in Amberleigh House’s Grand National victory in 2004. He was expected to take over the licence from his father at the start of the 2006/2007 jump season, but had to wait until June, 2006, before he was able to train in his own name as he needed to complete the appropriate British Horseracing Authority courses. Donald’s first winner as a licensed trainer came with Bearaway in a handicap chase at Newton Abbott on June 8, 2006. He secured his first Cheltenham Festival triumph with Cloudy Lane in the Fulke Walwyn Kim Muir Handicap Chase last season when he had 40 winners and had a second Festival success this year via Whiteoak in the David Nicholson Mares Hurdle. Donald is assisted by Ginger McCain. Jason Maguire, who was born on April 13, 1980, is the nephew of former top-jockey-turned-trainer Adrian Maguire. He started out in Irish pony races and partnered his first British winner, the Tony Martin-trained Search For Peace, at Cheltenham on November 12, 1999. He began riding for Gloucestershire trainer Tom George shortly after coming to Britain and enjoyed a seven-year partnership that yielded a Cheltenham Festival victory in 2002 when Galileo took the Royal & SunAlliance Novices' Hurdle. Maguire's working relationship with George, which was never contractually formalised, ended in January, 2007, and he is now attached to Donald McCain’s Cheshire stable. Maguire has had six John Smith's Grand National rides, with his best placing coming when finishing ninth on Tremallt in 2003. He took the valuable Lanzarote Hurdle at Kempton in 2003 on Non So and captured the 2007 John Smith's Midlands Grand National on Baron Windrush. He had a second Cheltenham Festival success this year on Whiteoak in the David Nicholson Mares Hurdle. John Smith’s Grand National Record: 2001 No Retreat (PU bef 17th); 2002 Birkdale (10th); 2003 Tremallt (9th); 2005 Europa (20th); 2006 Lord Of Illusion (PU bef 17th); 2007 Idle Talk (UR 19th).